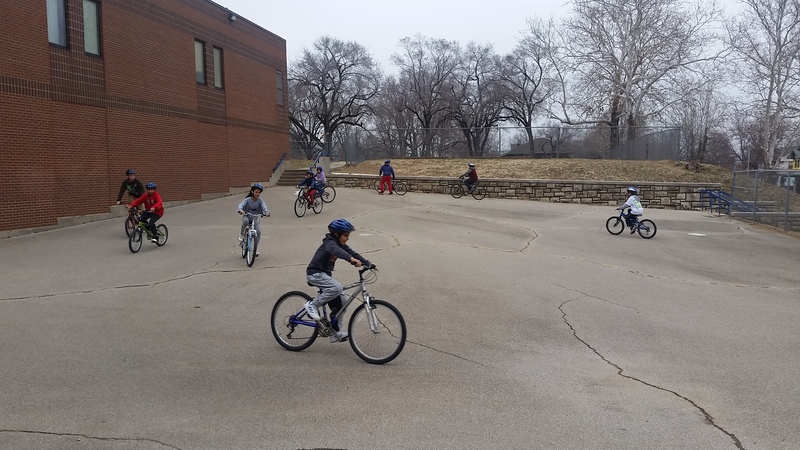 BikeWalkKC’s popular BLAST (Bicycle Lesson and Safety Training) and Earn-a-Bike programs are underway at the four Northeast Elementary schools. 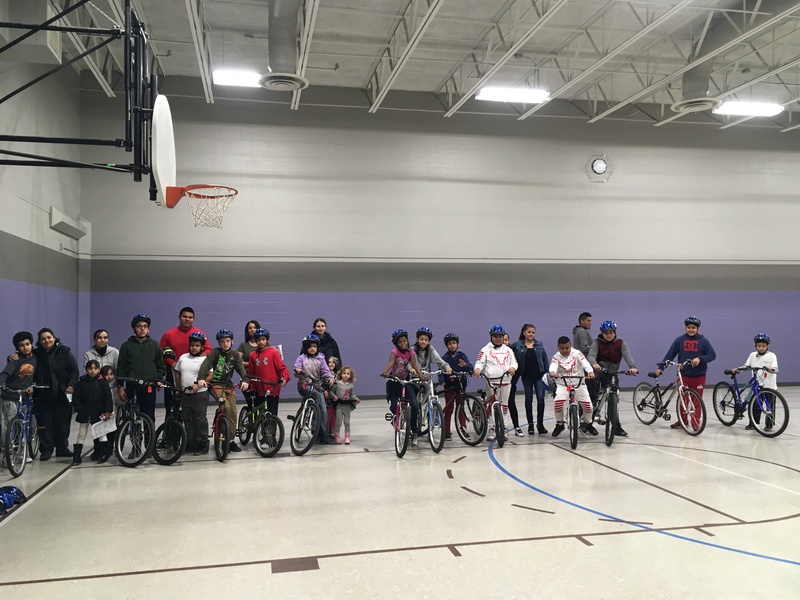 Just last week, Gladstone completed their Earn-a-Bike program with 21 students receiving bikes and helmets. These students, in addition to all other 4th and 5th graders, completed BLAST last fall. The BLAST and Earn-a-Bike programs are scheduled at the other elementary schools this spring: James, Whittier, and Garfield. We are excited to see the programs unfold and anticipate engaging nearly 700 students in the Northeast by the end of May. In addition to collecting standard program data through pre/post tests, behavior surveys, arrival/dismissal observations, and student travel tallies, BikeWalkKC is working alongside researchers at Children’s Mercy to evaluate the effects of Earn-a-Bike on student physical activity and travel patterns. Earn-a-bike students at Gladstone were excited to participate in the study and wear the “belts” with GPS and accelerometer devices. This study will continue with Earn-a-Bike cohorts at Whittier and James this spring and Garfield this fall. We hope to gain valuable insight about the effectiveness of Earn-a-Bike and student behavior in regards to active transportation to school. BikeWalkKC has met with several neighborhood groups and stakeholders, including: Mattie Rhodes, Northeast Alliance Together (NEAT), the Northeast Chamber of Commerce, LISC, and members of the Indian Mound neighborhood association. Engagement is ongoing throughout the project; and we anticipate reaching out to additional neighborhood groups and community partners this spring and summer. Other engagement efforts include built-in parent engagement days with each Earn-a-Bike cohort at the four elementary schools. This allows BikeWalkKC to interact with parents about our programs and hear about built environment concerns in their neighborhoods. Gladstone Elementary had a great turn out for their parent engagement day, with around 15 parents in attendance. They were very interested in walkability, their students earning bikes, and had a lot to say about student safety and the built environment around the school and in the surrounding neighborhood. Ultimately, these engagement efforts will help inform two quick-build interventions– where community partners, residents, parents, and students will work together to reimagine and redesign an intersection for two weeks. This will allow Children’s Mercy researchers and BikeWalkKC to gather information about the effectiveness of updated street design in changing driver behavior, student walking rates, and overall level of pedestrian and bicyclist comfort. We are excited about the project’s momentum so far and look forward to continuing education, engagement, and outreach efforts this spring. We are committed to redefining streets as places for people of all ages. 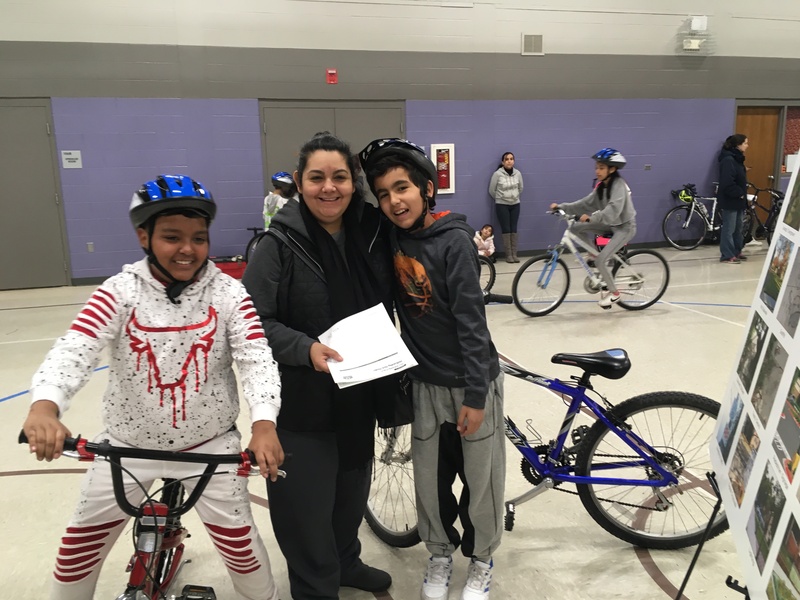 Find more information on our education programming and how you can be a part of getting more families on bikes on our Get Involved page! Posted in Aetna, Bicycling, News and tagged Aetna, kcmo, KCMO-Central, NortheastKCMO, Old Northeast.